I ain’t afraid of no girls. Who knew you could bust ghosts and be a lady? Definitely not the small, misogynistic army of internet commenters who have blasted the new film for remaking the ’80s classic with an all-female lead cast. So far they have harassed the stars, sent death threats to director Paul Feig, made the movie’s trailer the most disliked in YouTube history and spammed its IMDb page with negative reviews — all before the film was even in theaters. The film — and this should go without saying — does not deserve a fraction of this treatment. This modern supernatural comedy jaunt revolves around spectral scientists Erin Gilbert (Kristen Wiig) and Abby Yates (Melissa McCarthy). Once longtime friends, professional differences split the two until Erin’s curiosity pulls her back to the world of the paranormal. 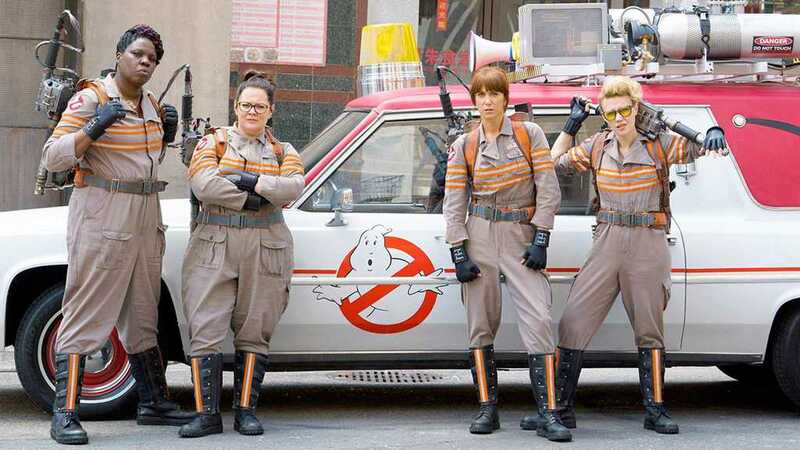 Completing their ghostbusting gang is equipment wiz Jillian Holtzmann (Kate McKinnon) and street-smart — literally, she has an encyclopedic knowledge of New York’s history — non-scientist Patty Tolan (Leslie Jones). The first thing that separates the remake from the original is the rapport between the characters. This not only reflects the splendidly hilarious work of the actors, but also the depth of the characters. Each one interacts naturally with the others and brings something unique to the team. This is in contrast to the original film’s “just go with it” approach to story, instead betting that you would like to know who’s doing the busting and why. One very noticeable thing is the movie’s familiarity with the franchise’s formula — public ghost extermination, surveillance by a government agency, the Ghostbusters meet the mayor, the Ghostbusters are told they can’t bust ghosts anymore, bad things happen, a giant something stomps through the streets, the Ghostbusters save New York City. The core of a Ghostbusters story is there, so all Feig and the cast had to do was make sure it’s funny — and they deliver. With a cast of two current Saturday Night Live members, one SNL alum and Feig-favorite McCarthy (“The Heat,” “Spy” and “Bridesmaids”), this should hardly be surprising. Wiig and McCarthy are dorky and energetic. Jones is a powerhouse of laughs, as usual. Chris Hemsworth, who plays the team’s secretary Kevin, sets a new Hollywood comedy benchmark for “handsome, dumb guy,” with a gut-busting interview scene where he explains why his glasses don’t contain lenses. The film’s only real low point is the villain, Rowan, a creepy hotel janitor with a ghost obsession, played by Neil Casey. Rowan is a one-note villain whose outline would barely take up half a page — but this might hold an underlying purpose. An anonymous villain, with no background to speak of and a bunch of time on his hands, who is convinced his only purpose is to bring down the female Ghostbusters? Doesn’t that sound familiar? The finale is a modern upgrade to the “Ghostbusters” plot formula, in which Rowan opens a bridge to the paranormal realm and the Ghostbusters have to fight their way to him. The final fight would be impressive if it didn’t look so much like “The Avengers” but with ghosts. But McKinnon does crush it here as well, dual-wielding pistol-proton blasters in a slow-motion fight scene set to the original theme in what might be the most beautiful sequence of the movie. All of this should be enough to silence the meninists, but perhaps they need to hear it from the original cast? Well they can, because the film features cameos from Dan Aykroyd, Sigourney Weaver, Ernie Hudson, Annie Potts, and even Bill Murray, who almost single-handedly halted the production of Ghostbusters 3 for years. Each appearance is satisfying, does its part in the larger plot and doesn’t waste too much screen time. With a feminist reboot of an ’80s classic this good, rest assured that the Rowans of the world will never win.